We welcome individuals, business workers and business owners in Oxted and the surrounding areas on our netwalks. Our groups are friendly non-pressured, building partnerships both professionally and socially. Your First netwalk is FREE - sign up today to register for the next walk. ​If you join our partner group Oxted Networking for £20 then members get FREE walks. Otherwise they are £10 per walk. Bluebell walk starting at The Grumpy Mole at 11am. This wonderful walk will include some mindfulness practises that will help you to de-stress your mind and connect to the present moment. Tansy will also share some interesting facts and research on walking and talking and how this can be used as a tool in your own business. Tansy Jane Dowman is a Holistic Life Coach who uses walking in Nature as a tool for personal growth and well-being. With training in Mindfulness and Forest Bathing she also holds her own regular group mindfulness walks and hosts walks at various well-being retreats, workshops and company well-being days. The name Tansy is a wild flower and she grew up in a tiny village in Essex so Nature is indeed a strong part of her identity. Once she started to offer 'walking and talking' coach sessions, she began to notice that her clients went through powerful transformations at an accelerated speed. This fuelled her passion to understand the power of Nature more deeply and she will share some of these fascinating insights with us on the walk. From a business perspective walking in Nature can be a powerful tool for creativity, problem solving and relationship building. Nature can also be a wonderful teacher and holds many beautiful metaphor that can guide us on our paths and support us in challenging times. A netwalk is just like business networking, but we walk and talk instead! 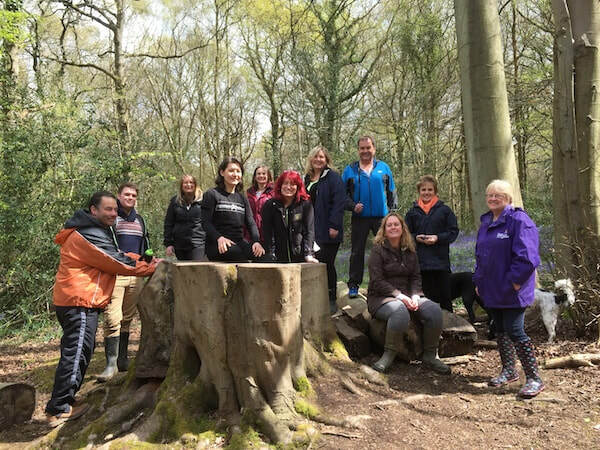 Oxted Netwalking has the bonus of being led by a team professionals. Take a look at the many benefits walking meetings have and learn about what businesses attend walks - it works! ​"Time is one of the most valuable assets in business, by combining networking, development and fitness you are using your precious minutes to the maximum." ​​Your first taster session is FREE and subsequent sessions are £10. If you are a member of our partner group Oxted Networking then all walks are FREE. Lunch is payable directly to the venue unless stated. You will be led by Lee Pegrum - Event manager, designer and business inspirationalist at Indigogo and Webleegogo. 2 miles (1 hour) long. We set the route and pace according to the abilities and requirements of the group. Most of the walks start at a pub of food venue, this provides a reward to sit down for brunch/lunch or a lite bite at the end of a the walk. Introductions by your guides and disclaimer signing. Brief introduction from you the Oxted Netwalking participants. Walk and network for 1 hour to 1.5 hours, depending on how much you talk! During the walk your guides will rotate amongst everyone, they will be there to answer any questions. We will stop at regular intervals to pause for breath and have a group chat. Feedback at the end of the walk. at 11am (unless otherwise stated). Paid up members only meeting with a FREE lunch. Join today for £20 and all walks are free! Friday 8th February - morning netwalk at 10am starting from The Bull in Limpsfield followed by a fundraising AmpuTEA with pastries, cakes and all things tasty including lovely stalls from local businesses, selling skin care products, clothes, candles etc. Raising money for local charity Limbpower. Friday 8th March - 11am starting at The Carpenters Arms Limpsfield Chart. Friday 26th April - 11am Bluebell walk starting at The Grumpy Mole. Coming soon more walks in the lovely Surrey countryside.